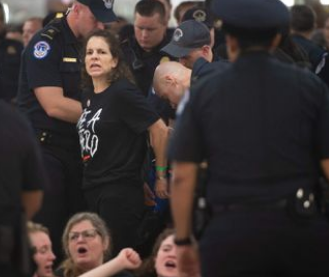 Hundreds of activists, were arrested at an action to #StopKavanaugh in Washington, DC. Act.tv was live on the scene. In this video you will see arrests of those who staged a sit down protest in the hallways of a Senate office buildings as they chanted "We believe Dr. Blasey Ford," "We believe Deborah Ramirez," "We still believe Anita Hill," and "We will not be silenced. The people united will never be divided."